Other pizza toppings that the kids like such as, pepperoni, ground beef, or olives. 1. Preheat toaster oven to 400 F degrees. 2. 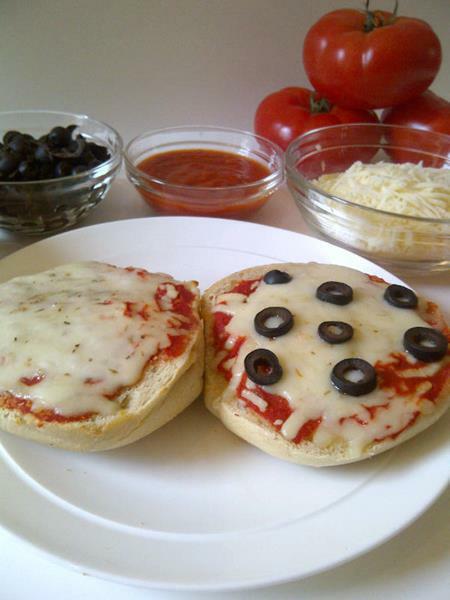 Slice bagels in half and toast them lightly in the toaster oven to prevent the pizza bagel from being soggy. 3. Spread a thin layer of tomato sauce onto the bagel. It’s important not to put on much sauce so the bagel won’t be soggy. 4. Sprinkle shredded mozzarella cheese on the bagels. Then add the toppings. Sprinkle with oregano or Italian spices if the kids like spices. 5. Heat in the toaster oven for about 8 minutes or until the cheese is melted.